The relationship between the Christian and culture as resident aliens in this world. Peter wants the hearers of his epistle to understand who they are before God so they can be who they are in in the world. 1 Peter tells us not so much how we are to think about God, but what He thinks of us. First Peter makes two references to its author: “Peter, an apostle of Jesus Christ” (1:1) and “a fellow elder and a witness of the sufferings of Christ, as well as a partaker in the glory that is going to be revealed [the resurrection]” (5:1). This tells us the author is the Apostle Peter, who was an Apostle but also an elder (the preferred term for a pastor in ethnically Jewish congregations; Greeks preferred “bishop” or “overseer”), and a witness to Christ’s sufferings. In the late second century, Irenaeus (130 – 202 AD, a student of Polycarp, who was a student of the Apostle John) is the first to mention Peter as the author of 1 Peter (Against Heresies, 4.9.2 and 5.7.2). In the third century, Eusebius cites a tradition from Clement of Alexandria (150-215 AD) that Peter was the author (Church History, 2.15.2). Though Peter used descriptions like “fiery ordeal” to describe suffering, the nouns for persecution all refer to verbal slander, malicious talk, and false accusations—not physical or legal action: katalaloun, 2:12; 3:16; eperazein, 3:16; oneidizein, 4:14; and kakoun, 3:13. So, Peter was referring to social pressure and persecution, not official Roman legal persecution. Second, since Peter was martyred during Nero’s persecution (64-68 AD, (1 Clement, 5.4, Eusebius, Church History, 2.25.5), this letter had to be written before he died. This gives the date for his letter to be in the early 60s AD or earlier. The author refers to his location as “Babylon” (5:13), a nickname for Rome. Though not definitive, 1 Peter also shares many theological terms used in other writings written from Rome: Mark, Romans, Hebrews, 1 Clement, and The Shepherd of Hermas. 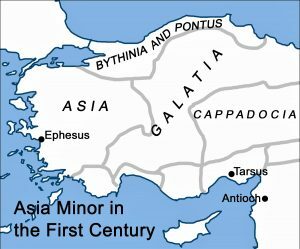 The congregations mentioned in Pontus, Galatia, Cappadocia, Asia, and Bithynia are in areas not evangelized by Paul or another known Apostle. The listed order is probably the planned route through which this letter would be taken. A ship sailing from Rome to this region would first stop at Pontus, which begins the list. The letter carrier, probably Silvanus (Silas) would depart back to Rome from Nicomedia in Bithynia. Internal evidence within 1 Peter begins in the first verse. The word “Diaspora” (1:1) builds on the imagery of an exiled Jewish people in the Babylonian captivity (586 BC). Peter also identifies himself as being in “Babylon” (5:13) as he wrote to those outside the community where they lived (2:12, 4:3). The Jewish character of Peter’s audience is supported further by what he says in 1 Peter 2:9, where he reminds them that they are a chosen race, a royal priesthood, a holy nation, and God’s own people. This is a direct echo of the Torah’s description of what God said to Israel. For external evidence, the Apostle Paul wrote: “On the contrary, when they saw that I had been entrusted with the gospel to the uncircumcised, just as Peter had been entrusted with the gospel to the circumcised” (Galatians 2:7). There are others, but we’ll cover them when we get to them. Peter expects his audience to know Jewish traditions and the Old-Testament echoes he uses. This not only points to mostly Jewish recipients of his letter but also that they are not illiterate. So, Peter writes to well-educated Jews with a solid background of the Old Testament, specifically the Septuagint. Peter used 547 different words in 1 Peter, 61 of which occur nowhere else in the New Testament (34, however, are in the Septuagint). Seventy-four occur only twice. Based on the vocabulary used, this tells us the intended audience is educated and literate, and likely financially well-off. Some of the wives in his letter adorned themselves with gold ornaments and beautiful clothing, another indicator of considerable wealth (3:3-4). Even the slaves he references are upper-class slaves (2:18-25). Peter didn’t use the generic word for slave, doulos, but oiketes, a word denoting a higher and educated class of slaves found in the larger, wealthier households. 1 Peter assumes his intended hearers know Greek—and know it well. The letter was composed “with the help of [or through] Silvanus” (1 Peter 5:12), which helps explains the better grammar (but he is still no Luke). The used literary style supports this. In the first century, three main styles of Greek existed: Koine (the most common style of New-Testament Greek), Atticistic, and Asiatic. 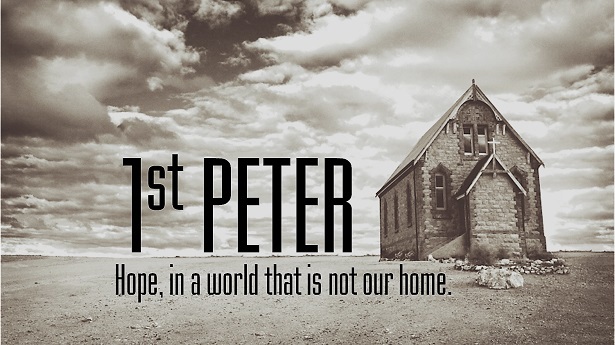 1 Peter is written in the Asiatic style, which makes sense considering the location of the intended audience. Concise: Terse, focused on a smooth-flowing text, packed with meaning, but also meant to please the ear. Despite the literate audience, this form is meant to be heard, not read. This is the style of 1 Peter. Ornamental: Wordier and a higher use of repetition, but also strives for fine use of language. This is the style of 2 Peter. In 1 Peter 1:1-2, we find a greeting laden with some of the richest theology in all the New Testament. So, we’ll take a bit more time exploring this than we would otherwise. What is the significance of the author being an “apostle”? What is the significance of Peter being an “an apostle of Jesus Christ”? From an Old-Covenant perspective, an “apostle” is the New-Covenant equivalent of a shaliach, someone appointed and authorized as a representative to carry out specific, designated tasks. In Exodus 3:10 and Isaiah 6:8, the Septuagint translated this idea as “apostello”. We find the same “sending” terminology used for others, such as Elijah (2 Kings 2:2, 4, 6), Jeremiah (Jeremiah 1:7), and Ezekiel (Ezekiel 2:3-4). (In the New Testament, see Matthew 10:5-40, Mark 3:13-19, John 13:16, and 2 Corinthians 8:23). Within Judaism, a shaliach could not pass on his authority to another. So, if this remained true in the New Covenant, then no Apostles would come after the Twelve, whom God authorized—only pastors. What is the first term Peter uses to describe the recipients of his Epistle? Who did the “electing” or choosing? “elect”: Greek, eklektoi: In the Septuagint, this referred to the nation of Israel as God’s chosen people (Deuteronomy 4:37, 7:6, 10:15, 14:2; 1 Chronicles 16:13; Psalm 105:6, 135:4; Isaiah 41:8-9; 65:9, 15, 22). What’s the idea behind being an “exile”? “exiles”: Greek, parepidemoi: A foreigner staying in a place where he had little or no legal status. This is an underlying theme of Peter’s entire letter (1:3-4:11). The end of a Christian’s exile, however, is not when Christ takes someone’s soul to heaven, but when He returns from heaven in glory and power and conforms us to His glory. What is the dispersion? How does this let us know who the recipients of this letter are? “dispersion”: Greek, diasporas, literally meaning “sown abroad.” For ethnic Jews, this meant living outside of Israel, not in the Holy Land. (See Deuteronomy 28:25, 30:4; Nehemiah 1:9; Psalm 147:2; Isaiah 49:6). Philo, a Greek-speaking Jewish scholar (20 BC-50 AD), testified to the presence of a Jewish diaspora in these areas of Asia (On the Embassy to Gaius, 281). First, “dispersion” refers to the actual experiences of those to whom Peter writes. In his day, “dispersion” had also become a metaphor for social ostracism and harassment. Second, when they understand their experience from the perspective of God’s chosen, Israel, they too can know they are God’s chosen people. How did these Christians become part of the Elect? “foreknowledge”: Greek, prognosin. This foreknowledge of God is more than knowing something ahead of time; it also includes God choosing, according to His purpose and plan. How does God do this? Grammatically, the Greek Peter uses can mean “for obedience to Jesus Christ (to obey Jesus) and for sprinkling with his blood (to have his blood sprinkled on us). This, however, makes no sense, for Peter is explaining how all three Persons of God are involved in “electing” us. Which Persons of God are involved in someone becoming part “the Elect”? The sprinkling with Jesus’ blood hails back Numbers 19. There, the ashes from a sacrificial burnt offering of a red heifer were mixed with water. The Priest then sprinkled the mixture to purify those who became defiled by death by contact or association with a corpse. The “water of sprinkling,” was used several times in the Septuagint: Numbers 19: 9, 13, 20, 21. In the New Covenant, how does someone become holy because he is defiled by death? 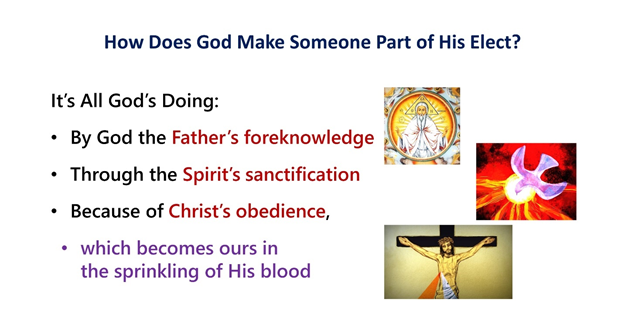 Where the blood of Jesus comes to us “sprinkled” in water, where all three Persons of God are at work? Using the same word for “sanctification, Paul wrote: “You were washed, you were sanctified, you were justified in the name of the Lord Jesus Christ and by the Spirit of our God” (1 Corinthians 6:11). If Peter is referring to baptism in some way, he should cover this topic more fully later. What is the blessing Peter writes to his hearer? “May”: We often understand “may” as a possibility of something happening. Here, it is used—not as a wish or even a prayer—but as a declaration of God’s blessing to those who are in Christ. This blessing presents, in miniature, the entire message contained in Peter’s letter. Throughout his letter, Peter exhorts Christians to be a people of peace—both as an inner quality and in relationship to the wider world. This more likely refers to a proverb from Seneca (1 BC-65 AD), Ignis aurum probat, miseria fortes viros (“Fire tests gold, affliction tests strong men”; On Providence, 5.10).